Hi friends, I’m super excited to be a guest designer for the June challenge at Where Creativity Meets C9. If you’re joining me for the first time, welcome, I’m happy you’re here! This month’s challenge is all about layers, which I will admit is not my strength. But I love a challenge. For my card, I layered all sorts of things: textures, media, die-cuts, embellishments, and of course, paper. First, I used the outer die from the Pretty Petals die set to cut out the large flower from watercolor paper. Then I stamped the flower details from the coordinating stamp set in Versamark and heat embossed with clear powder. I added a watercolor wash using my new favorite paints, Sennelier L’Aquarelle. I then used the detail die to get the individual petals and painted those green to stand in for leaves. I used the Friend Like You die to cut the sentiment into the flower, and then adhered the petals behind it. I then used a stitched rectangle die on a piece of kraft cardstock and also used the border from Friend Like You for a little extra detail. I stamped the large stripe from Stripe Builder in Versamark for a watermarked look. For embellishments, I added some string and Nuvo Crystal Drops in clear (water droplets!). 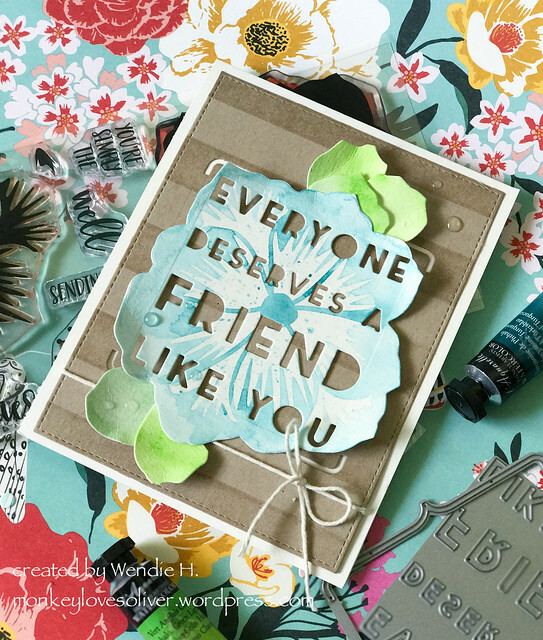 Thanks for stopping by and I hope you enjoyed my card for the June challenge at Where Creativity Meets C9! I think this Challenge was truly a challenge for all of us! Lol. What a delight to have you join this month, though. Your card is stunning!!! It’s my favorite. 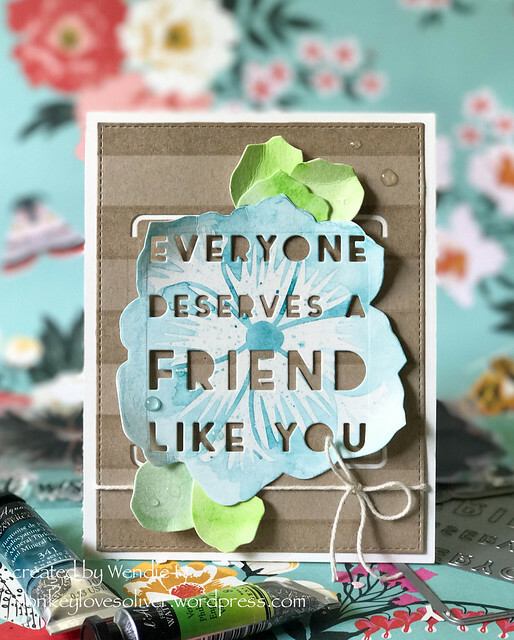 🙂 Your layered die cuts are brilliant! I would have never thought to put the quote due on the flower and cannot believe how perfectly it fits. I truly love everything about your card! This is marvelous! You absolutely nailed this (somewhat challenging) theme. I love it! Thanks so much for joining us over at Where Creativity Meets C9!